I wanted to make quesadillas, but didn't have tortillas, and didn't feel like running to the store for some. I 1/2ed this recipe because I didn't need very many. My husband LOVED them!!! And I was wondering how he'd react, as he's very picky. He thinks these really are so much better than store bought. I did substitute shortening for lard, and used hot water. The dough is nice and stretchy, and I could roll them very thin with a wooden roller. So delicious. 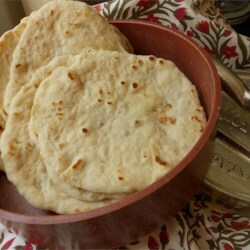 I was surprised though, especially with my baking experience, that 1/2 the recipe made only 4, 8-10 inch tortillas. I guess 2 cups of flour doesn't go far in this recipe, but there really aren't any other ingredients so I guess that's it. So good though. You won't regret using this one.